All Rolling Hills homes currently listed for sale in Rolling Hills as of 04/21/2019 are shown below. You can change the search criteria at any time by pressing the 'Change Search' button below. If you have any questions or you would like more information about any Rolling Hills homes for sale or other Rolling Hills real estate, please contact us and one of our knowledgeable Rolling Hills REALTORS® would be pleased to assist you. "Resort Behind the Gates!! 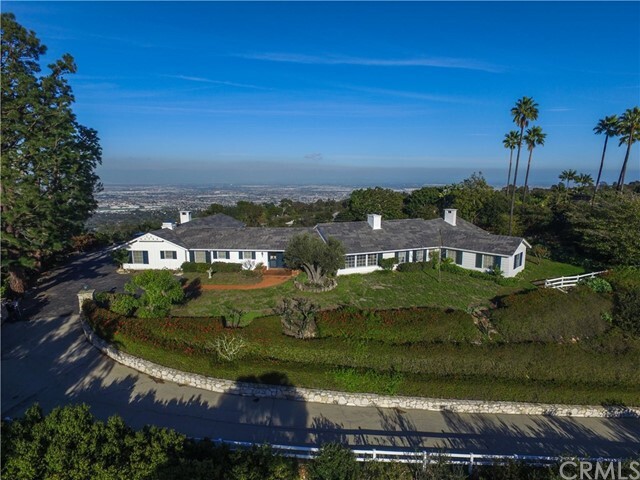 This exquisite Rolling Hills estate is situated on 5 acres with panoramic city views! A sprawling 8250sf of living space, 5 bedrooms and 8 bathrooms, this luxury home feels like a resort and has all of the amenities. Enjoy sunny days by the pool, grill on one of the two outdoor BBQs or relax in the private sauna. Additional activities include 2 outdoor fire pits, pizza oven, keg tap, tennis court, putting green, and an impeccably maintained, dual-waterfall, 2,200gal koi pond. Home interior includes a grand entry, exercise room, two offices, sub-zero appliances, main kitchen, secondary stainless steel chef s kitchen, media room with kitchenette, v14 TVs, fully-integrated Crestron automation system, iPad controls, on-site generator, 7 air-conditioners with HEPA filters and UV sterilization, security cameras, emergency vault with two safes, and a beautiful brick-ceiling wine cellar. The master wing is complete with two expansive walk-in closets, an extra room for office or gym, and private laundry facilities. Attached to the main 4 car garage is a single-car garage with built-in stainless steel workshop. Want more? This property boasts a 100-tree citrus orchard and approximately one acre of primed land complete with irrigation. A perfect canvas for orchard expansion or turn-out for horses. This unique property is the epitome of luxury living!" "This dramatic, one of a kind Spanish estate was built in 2009 and is accentuated by panoramic, queens necklace, ocean and city lights views. Located towards the end of a quiet cul-de-sac, a secluded courtyard entry leads to the living room and dining area, where the views are front and center! The gourmet kitchen has a magnificent center island, Sub Zero refrigerator and Viking range. The adjacent family room has a huge fireplace and massive picture window to enjoy the panoramic views. The pool, spa and outdoor entertaining areas are accessed from multiple rooms, and provide incredible indoor / outdoor flow. The sumptuous master suite includes an oversized bedroom with fireplace, huge walk-in closet, and luxurious bathroom with private outdoor shower, a second spa and fireplace! Downstairs, you ll find a media room, play room, card room, temperature controlled wine cellar, double-reinforced music room, custom gym, and a sequestered 4th bedroom. I mentioned the outdoors there s a sports court, putting / chipping area, huge grassy area, as well as a separate guest quarters with fireplace and full bathroom. Fully integrated Crestron system, custom lighting, 6 fireplaces, A/C, a 3-car garage, hardwood floors, and so much more!" 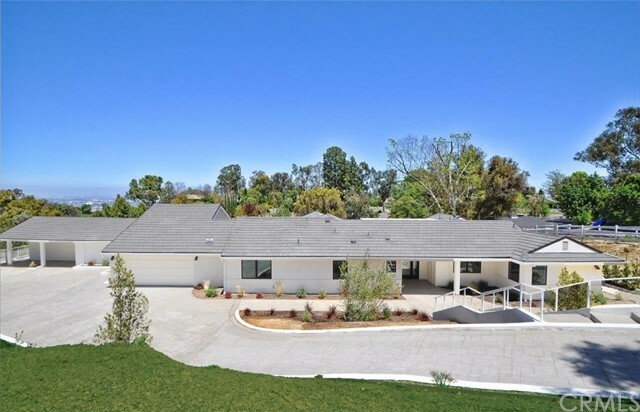 "This 21st century modern masterpiece is located within the gated and 24 hour guarded city of Rolling HIlls. One of the most prestigious homes designed by the famous architect Criss Gunderson,completed and ready for the new owner!! This home has lovely views of the vibrant city and mountains with total privacy!Short distance to LAX and all the LA metro facilities, but it feels like living in a mountain that s so close to nature. This single story residence combines quality modern materials with the luxury amenities worthy of a five-star boutique hotel, it sets amid a vast landscaped garden with a huge swimming pool and spa.The home s sumptuous master suite has his and her separated bath and closet, while 4 additional suites each feature privacy on their own wing with a media room.You will also find a gym and a library. Huge living, dining and great room are all designed for comfortable everyday living and entertaining, high ceilings thru out with lot s of glass doors/windows.Huge patio area around the pool with fireplace, TV screen, fire pit and full out door kitchen, sauna and a pool bath. A wine cellar for storage of about 900 bottles,also an additional suite on the other wing of the home for a visitor or caretaker. All these with a 6 car garage with A/C and best of all, all on one level and turnkey!! You will never see another great opportunity like this again!! Reduced from $10999000 to below cost at $7188000, must sell!" 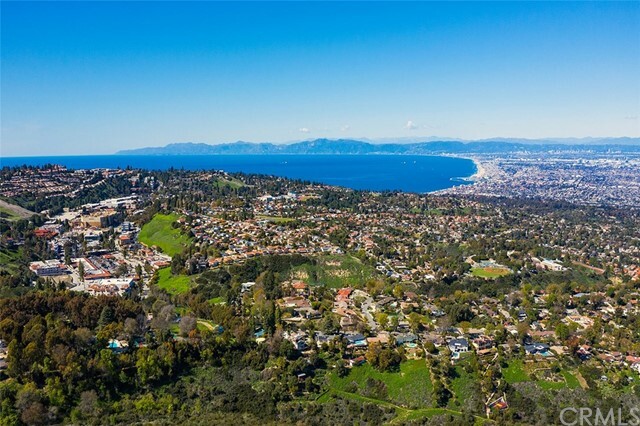 "A RARE OPPORTUNITY TO BUILD OR RENOVATE YOUR DREAM HOME ON A 4 ACRE PARCEL WITH EXPANSIVE VIEWS OF, CATALINA AND OCEAN SUNSETS TO THE SOUTH AND QUEENS NECKLACE, COASTLINE, MOUNTAINS AND LOS ANGELES CITY LIGHTS TO THE NORTH. 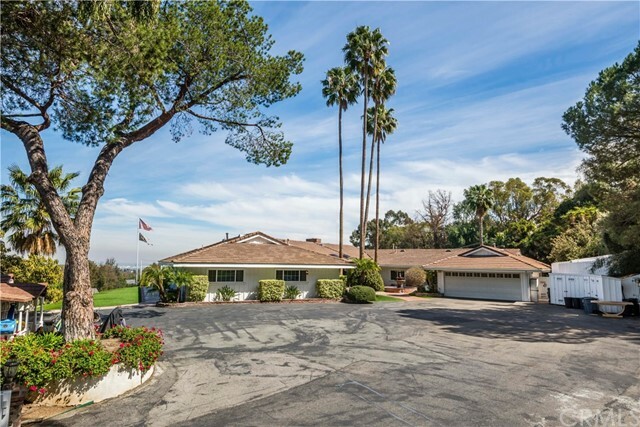 LOCATED IN THE EXCLUSIVE PRIVATE CITY OF ROLLING HILLS, THIS HOME WAS EXPANDED IN THE 1970'S AND HAS BEEN LOVINGLY MAINTAINED THROUGHOUT THE DECADES OF OWNERSHIP. SELLER HAS ADDED A NEW 50 YEAR ROOF LAST YEAR, ALONG WITH NEW HARDWOOD FLOORING IN KITCHEN AND FAMILY ROOM. THE SPACIOUS OPEN FLOW OF THIS CLASSIC RANCH STYLE HOME EVOKES BEAUTIFUL MEMORIES OF THE PEACEFUL RURAL LIFESTYLE OF ROLLIN HILLS. WITH FIVE BEDROOMS, OFFICES, LARGE MASTER SUITE WITH HIS AND HERS AREAS, THESE ARE BUT A FEW OF THE FEATURES OF THE HOME. THERE ARE THREE FIREPLACES, ONE IN THE LIVING ROOM, FAMILY ROOM AND MASTER BEDROOM. THERE IS A LARGE POOL AND SPA WITH THE MOST INCREDIBLE VIEWS AND NUMEROUS FRUIT TREES. THERE IS AN ORIGINAL BARN SITE WITH AMPLE CORRAL AREAS. ROLLING HILLS OFFERS 50 MILES OF DEDICATED TRAILS, THREE COMMUNITY TENNIS COURTS, TWO EQUESTRIAN RIDING RINGS AND 24 HOUR GATED ACCESS FOR ADDITIONAL PRIVACY." "A true gem in prestigious Rolling Hills, a private, gated community located atop and in the center of the scenic hills of Rolling Hills. One of a kind home ideally located on coveted Crest Road near the West Gate with sprawling east to west views of Southern California coast, Exceptional 6 bdrm + library, 7 bthrm home is classic ranch style perched on a park-like lot with an open layout perfect for the peaceful rural lifestyle of Rolling Hills. Drive through private gate to circular driveway with water feature and Enter the home to face immediately picturesque views . Large formal dining area features large windows with views, wet bar, and wine room. Dining room flows easily into a bright living room with high, vaulted ceilings and a grand fireplace. From there, relax and take in unbeatable views . The stunning lot features generous lawn for lounging, a separate BBQ area, a covered wraparound deck, pool with jacuzzi, full sized tennis court with panoramic views, and separate chicken coop with fruit and vegetable garden. Extra large master suite has high vaulted ceilings, cozy fireplace, room sized walk-in closet. Generous chef's kitchen has high vaulted ceilings, beautiful custom cabinetry, and Viking appliances. Warm and inviting adjacent living room with fireplace is perfect for lounging with friends and family. Home also boasts private office/ library with beautiful built-in shelving. Second master suite and every other bedroom have ensuite bathroom and walk-in closet." 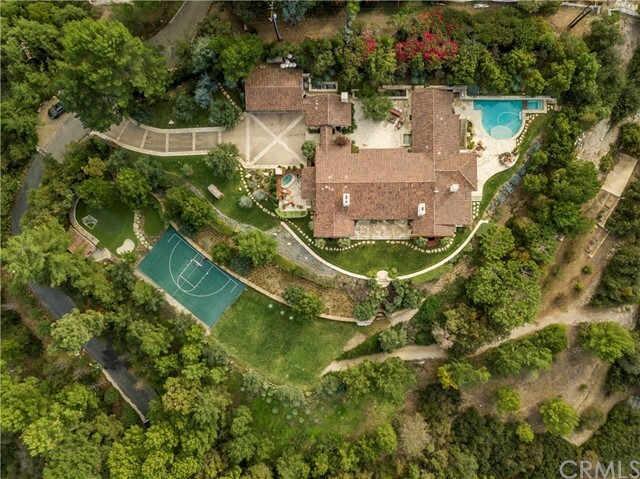 "Located in the private gated city of Rolling Hills, 8 Quail Ridge N is one of Los Angeles County s great properties. Nestled on over 5 acres of land at the end of a quiet cul-de-sac, it boasts unobstructed city, Queens necklace, and mountain views. The custom built, single-level home features an open floor plan with spacious rooms that expose the panoramic views and make this a perfect place to entertain. The expansive family room has beamed ceilings, a wood-burning fireplace, and a generous sunken bar. Adjacent to the family room sits the beautiful formal living room with marble fireplace. The kitchen features a large center island, walk-in pantry, double Sub-Zero refrigerator, and two ovens and microwaves. All bedrooms are situated away from the main living areas and boast oversized walk-in closets and private bathrooms. The elegant master suite has a stone fireplace and floor-to-ceiling sliding doors and windows that showcase the breathtaking panorama. An attached four car garage provides ample room for storage and workspace. Other highlights of this distinctive property include an attic and a beautiful pool, spa, and terrace that border the edge of the hill and 180-degree view. There is a two-story barn (currently outfitted as an extensive home gym) with tack room, hay storage, three stalls, and a large corral. Beyond the barn lie the gentle slopes of the undeveloped portion of the property s acreage with direct access to 48 miles of trails. Unlimited adventure awaits!" "Rolling Hills meets Ralph Lauren... A long, stamped driveway and a secluded entry awaits. Step inside to reveal a chic interior, including dark hardwood floors, custom ceilings, skylights, crown moldings and walls of French doors. The home is centered on a dramatic living room, which overlooks the stunning pool and spa. On one side of the house you ll find 3 spacious bedrooms. The other side is occupied by the open kitchen, family room with fireplace, and the romantic master-suite with walk-in closet. You'll marvel at the outdoor space and panoramic views. 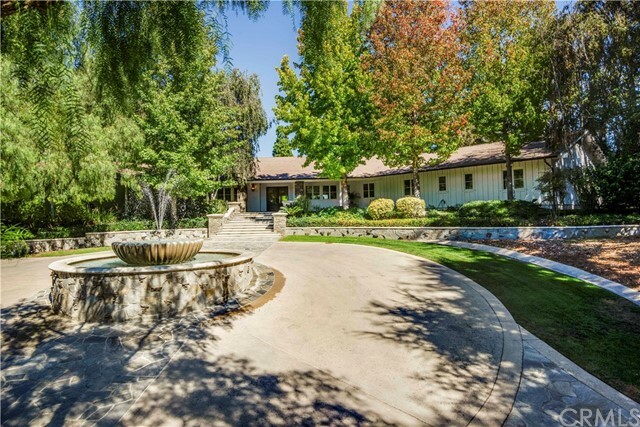 Surrounded by stately trees, this 8 acre estate offers a North / South tennis court, a secluded guest house with living room, bedroom and bathroom, and incredible horse facilities with riding ring, and a 6 stall barn with an amazing, finished loft area. There's a spacious 3 car garage and a large laundry room that opens to an enclosed side yard, which is perfect as a dog run. Whether entertaining friends or family, this home has it all!" "Located down a long, private driveway, your personal paradise awaits! With panoramic ocean views from the living room, chef s kitchen, family room and master suite, entertaining is a treat! A formal entry opens to the formal living room with vaulted ceiling, fireplace and large picture window. A long gallery leads you to the spacious formal dining room on one side, and the gourmet kitchen with huge center island and custom cabinetry on the other. The adjacent family room with fireplace and vaulted ceilings opens to the spacious backyard and entertaining patios. The sumptuous master suite has a fireplace, a luxurious master bathroom with soaking tub, a large walk-in closet, and a private laundry room. The entry level also includes, three additional bedrooms, each with its own bathroom, as well as a small nursery or office. Downstairs, you ll find an incredible family room with fabulous wet-bar, a large laundry room, and a secluded guest suite with private bathroom. There s even a massage room and salon-like bathroom! An attached, 3-car garage, hardwood floors and air-conditioning, are just a few of the many attributes. If you re looking for your own, private utopia, this is it!" "A HOME ABOVE THE CLOUDS. 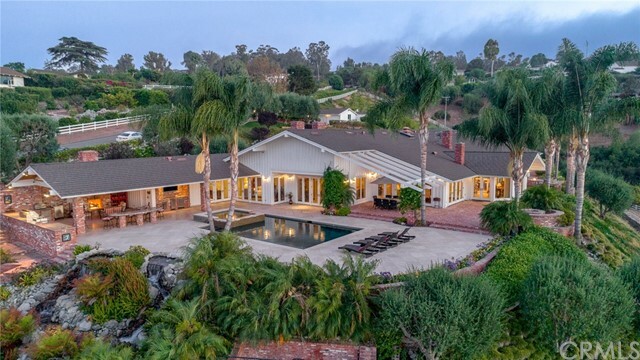 2.5-acre Estate located in the most prime and exclusive section of Rolling Hills. 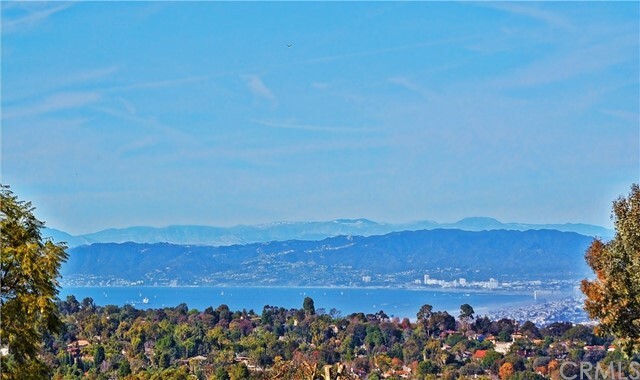 This charming home has a widest lot providing incredible Ocean, City, Long Beach Harbor Views. This home has walls of new glass doors and windows that bring magnificent views in. As you enter you will be welcomed by a large, open & elegant living room with high ceiling, slate floors, and installed surround sound speakers. The Master suite has a beautiful granite fireplace, gorgeous master bath, walk-in closet & again, amazing views. Open gourmet kitchen has been remodeled with granite counter-tops & professional appliances. It opens to an inviting dining room with sliding doors leading out to a backyard with magnificent views. Great outdoors with sparkling pool, spa, built-in barbecue, fire pit and lovely gazebo area with a very tranquil setting overlooking the city & ocean below. New hardwood in all bedrooms, new cabinets in bathrooms, kitchen, new paint, new front door. New driveway, plaster, BBQ, deck and pool including building the retaining wall, new patio area, all new landscaping and hardscape, new roof and gutters, new electric meter and brought the cables underground. Numerous fruit trees and lush landscaping, expansive brick patio perfect for outdoor entertaining. All this in the private, gated city with riding and hiking trails, lighted tennis courts, riding rings." 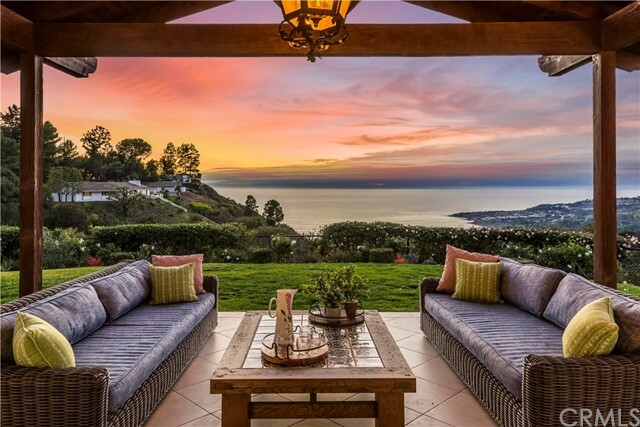 "Panoramic Coastline, Ocean, city and mountain views!! 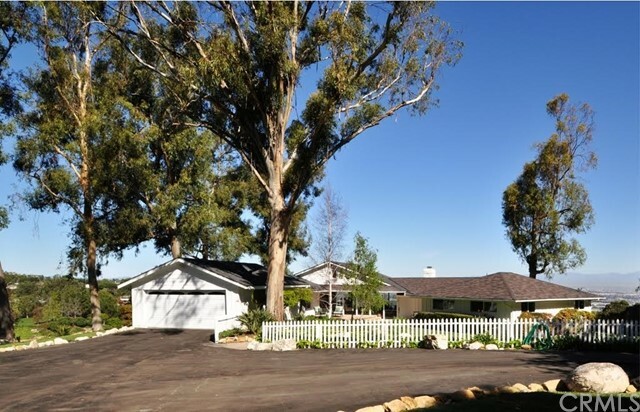 Located in a prime location close to the main gate within Rolling Hills on Saddleback. This home has been remodeled recently and features 5 bedrooms (one being used as an office), 4.5 baths plus a small living quarters with outside access as part of the 4 car garage. The open kitchen has new corner window to enjoy the queen s necklace/ocean views and has been remodeled with a great marble center island and top of the line appliances. The large formal dining rooms is excellent for big parties. Step down to the Living Room with fireplace and breathtaking views of the city and also queens necklace. The spacious Family room has vaulted ceilings, fireplace, built-in cabinets, and outdoor patios on both sides for indoor or outdoor entertaining. Master suite is on a separated wing, it has own sitting area with amazing views. There are multiple patios on the view side of the home for great outdoor entertaining. This property has a large lower pad with kid's play area and driveway access, which makes for an ideal horse area with barn or sports court, upon city approval. It also has many fruit trees, just name a few: figs, persimmons, lemons, apples and dates. Great value and a must see!" "For over 60 years the same family has owned and maintained this picturesque home at 8 Pine Tree Lane in the City of Rolling Hills. This is your opportunity to be its next owner. Ideally located in the 24 hour guard-gated community where your privacy and security is of up most importance. 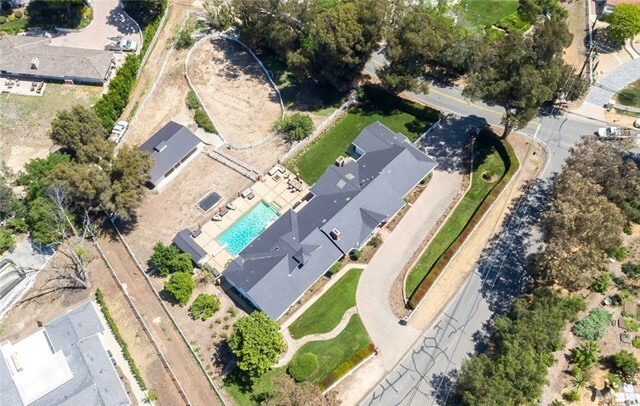 The gross 3 three acre plus property sits on a peninsula accessible by way of a meandering lane under large impressive Eucalyptus trees passing along an orchard and placing you in a large motor court area. The large stone patios prepare you for the comfortable California feeling you will enjoy through out the property and home. The light infused interior with vaulted ceilings and the sweeping floor to ceiling glass windows highlight the breathtaking view that can be enjoyed from nearly all of the open California lifestyle living areas. The panoramic view includes the rolling vistas of Rolling Hills, the Queen's Necklace of Santa Monica Bay and across the LA Basin. Enjoy the sun reflecting off the downtown Los Angeles skyline, the San Gabriel Mountains beyond with Mount Baldy as your beacon. Experience this unique view, whether inside or outside. day or night, and enjoy the serene tranquility of the beautiful grounds and the kaleidoscope of colors of the night lights"
"This gorgeous newer construction modern, ranch home is located in the prestigious gated city of Rolling Hills. This home was built for indoor-outdoor living, almost all living spaces extend to the outdoor decks, perfect for entertaining. This spacious open-floorplan features 4 bedrooms, 4.5 bathrooms, over 4,000 sq. ft. of living space. The heart of this home can be found in the expansive great room which includes a beautiful kitchen, dining area, and formal living room. Enjoy a more casual setting in the huge family room which includes a wet-bar and direct access to the viewing deck, set above canyon and city light views. The main bedrooms reside on the east wing, including the huge master suite with private bathroom and huge walk-in closet. Enjoy the ultimate, outdoor entertaining space on the main deck, with built-in BBQ, outdoor fireplace, covered space for dining and quick access to the great room. All of this while overlooking the sprawling grass lawn, pool, canyon and city light views. All you have to do is turn the key!" 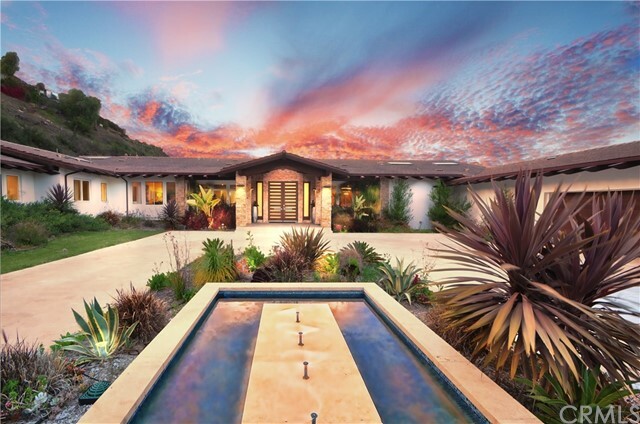 "This luxurious, dream home welcomes family and friends to a hideaway in the exclusive, gated city of Rolling Hills. This 4,470 sq. ft home is nestled on a huge, fully usable 1.3 acre lot. Enjoy this stunningly remodeled home, featuring 6 bedrooms, 5 bathrooms, a formal living room with fireplace, dining room, great room with 20-foot wood ceilings, wet bar and den. The heart of the home can be found in the gourmet kitchen which includes a spacious breakfast nook. This floorplan includes a guest bedroom, bathroom and a bonus basement for storage/workshop. Throughout the home you will find beautiful wood floors and high wood ceilings with unique detailing. The rest of the bedrooms plus an office can be found on the west wing of the home. Enjoy the master retreat which includes a walk-in closet, bathroom with marble details, and private patio access. Entertain guests in the sprawling outdoor oasis overlooking the enormous backyard with a pool, patio with fire-pit, a huge lower paddock with a 3-stall barn, riding ring and orchard." "Rolling Hills - but not behind the gates - fabulous! Great access to everything without the gate hassle but privately gated - wonderful!!! Enjoy the open layout of this mini ranch that has fantastic floor plan for entertainment and family enjoyment. 5 large bedrooms - huge center island kitchen - living room made for a crowd - master that is private and spacious!!! There is a huge bar off the family room with patio doors leading to the outside for enjoying the summer evenings, high beamed ceilings, hardwood floors, French doors, ceiling fans, tankless water heater, security system and huge driveway with parking for up to 40 cars. Think of the great parties! This is the perfect spot to call home. The pool area includes slide and built-in trampoline plus grassy space and the huge barn is just waiting for your horse and saddle! Don't miss out on the opportunity. 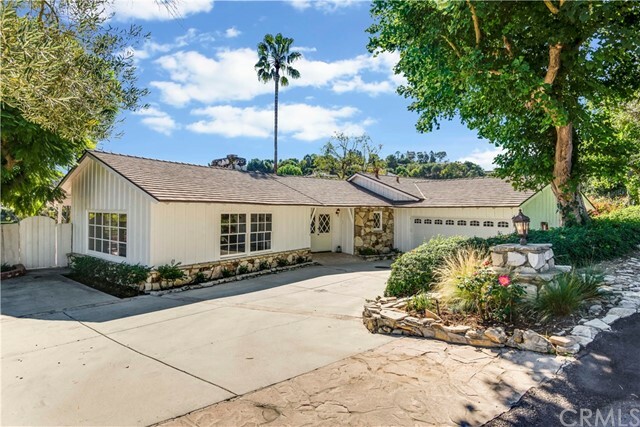 Could be yours..."
"Enjoy the pastoral ambiance of this traditional ranch style home located in the gated and guarded community of Rolling Hills. The immaculately maintained home offers both city and hillside views that enhance the unique living environment. The home boasts a 2,257 square foot floor plan with 3 bedrooms that includes a master suite, 2.5 bathrooms, spacious family with wood beam ceilings and fireplace, formal dining room and conveniently laid out kitchen with newer appliances. The interior accents include high beamed ceilings, wood siding and hardwood floors. 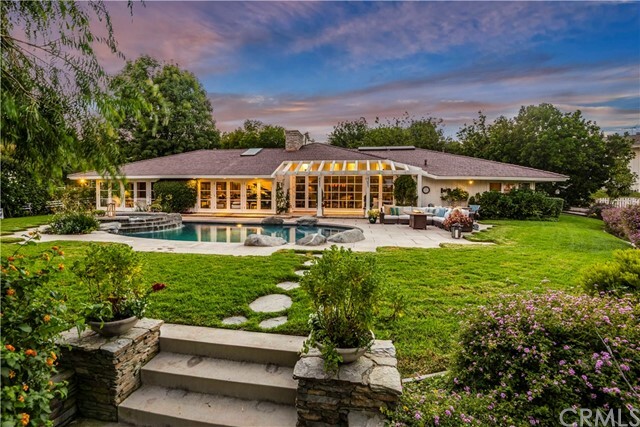 The 53,990 square foot parcel is situated on a private cul-de-sac street and is highlighted with a pool and spa, brick patio and lower level barn and turn out area."